Second today as part of the Leopard Trek TTT squad in the prologue of the Volta a Portugal, the promising 21 year old Belgian Sean De Bie has secured a pro contract with the Lotto Belisol team. The two year deal will begin next season and will see De Bie, one of the most promising young riders in cycling, get his pro career underway within an established WorldTour squad. De Bie is the nephew of the 1989 world cyclo cross champion Danny De Bie and also of the current Belgian national cyclocross coach Rudy De Bie. He showed promise in the youth categories, netting the national cyclocross title for his age group in 2006 and 2007, but decided several years ago to focus primarily on the road. Since then, he has taken a number of good results. Last year he won the opening stage of the Triptyque des Monts et Châteaux and was second in the Espoir Tour of Flanders; this year, he was second in both the Côte Picarde and La Ronde Pévéloise. 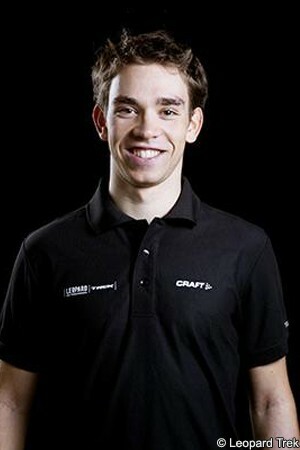 The biggest result however was his triumph last month in the European Championship road race for under 23 riders. He also won the Czech Olomouc. “Sean De Bie is unquestionably part of the top of the U23 at the moment,” said Lotto Belisol general manager Marc Sergeant. “His recent title in the European championship proves that. He’s part of a cycle family, can be brought into action on different terrains, but is someone with a preference for the Classic work and isn’t slow in a group at the finish. Yet to turn 22 and aware that he has plenty of learning ahead, De Bie states that he doesn't yet know what his role will be. But he’s determined to work hard and keep an open mind. “I want to grow in the team, so I become a great rider,” he said. “In my first year I want to learn and see how it all works with pros. On the moments that I can get to go my own chance in the races that suit me, I will try to set good results. For the rest I want to support the team and hope to become a fixed part of it.